Move over Taco Tuesday today I’m bringing you Friday’s Healthy Fish Taco Recipe. The weather was simply beautiful this past Friday, and my day was quite productive – I must add. I managed to whip up 3 delicious recipes that I will be sharing with you over the next week or so. In the meantime, I’ve also been gearing up for my 4th of July dinner. Friday was one of those days in which I was craving fish. I really didn’t know how I wanted it prepared I just knew I wanted fish and the best part was that the fam was totally down with fish too which made it easy. So, I decided to make my Healthy Fish Taco Recipe. This recipe is so easy and doesn’t require much effort at all and is perfect for a Friday night dinner. Who wants to slave over a stove on a Friday night – NO THANK YOU!!! 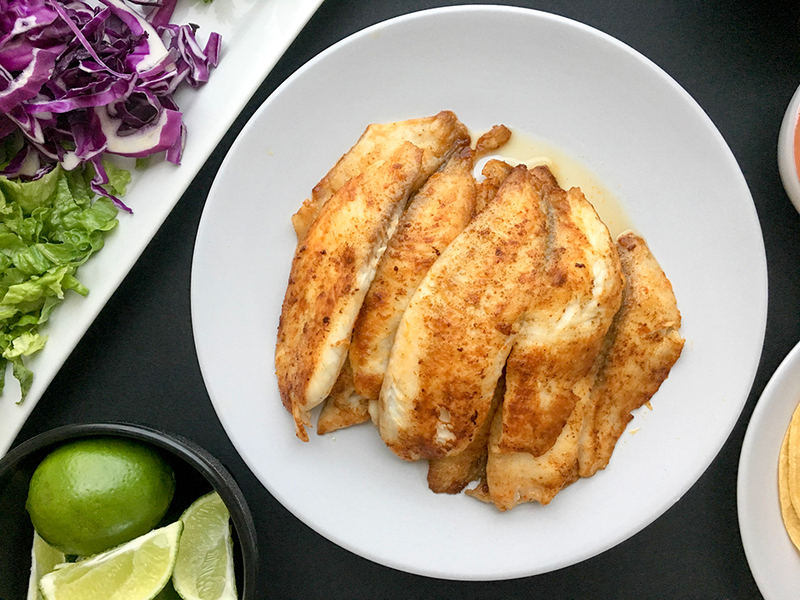 If you’re like me and prefer cooking a healthy meal with minimal ingredients after a long week then you’ll appreciate this quick Healthy Fish Taco Recipe. To be honest, the most time consuming part was cutting up the vegetables, seriously. If you’re looking for other simple seafood dishes, check out my Lemon Garlic Salmon. Veggies: I like to shred romaine lettuce and red cabbage for color. I think the purple cabbage makes for a wonderful presentation due to its beautiful and vibrant color. You can also top with additional veggies such as diced onion and tomatoes and sliced black olives. Tortilla: Which do you prefer? Corn, white four or wheat flour. When it comes to fish tacos, we prefer soft corn tortillas. Salsa: Homemade salsa is the best and it worth taking the extra time to prepare. I start by roasting roma tomatoes in the oven until the tomatoes have blistered. I then add the blistered tomatoes in my food processor along with fresh garlic cloves, cilantro and salt and pulse until I get the desired consistency. Guacamole: Homemade guacamole is another condiment that worth taking the extra step. I simply cut open an avocado and place the flesh of the avocado on a chopping board and mash it with a fork. I add minced garlic, lemon juice and cilantro and mash until I get the desired consistency. Sour Cream: We all love sour cream. I always go for the lighter version, or I sometimes add a dollop of plain Greek yogurt instead of sour cream for extra protein. Assembly: It’s up to you. You can add your fish first then top with your veggies or you can add your veggies first and top with your delicious seared fish. 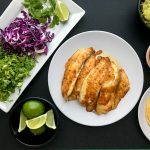 I can’t forget to add that I always top this Healthy Fish Taco Recipe with chopped cilantro and fresh squeezed lime juice to brighten the overall taco experience Yummmmm. 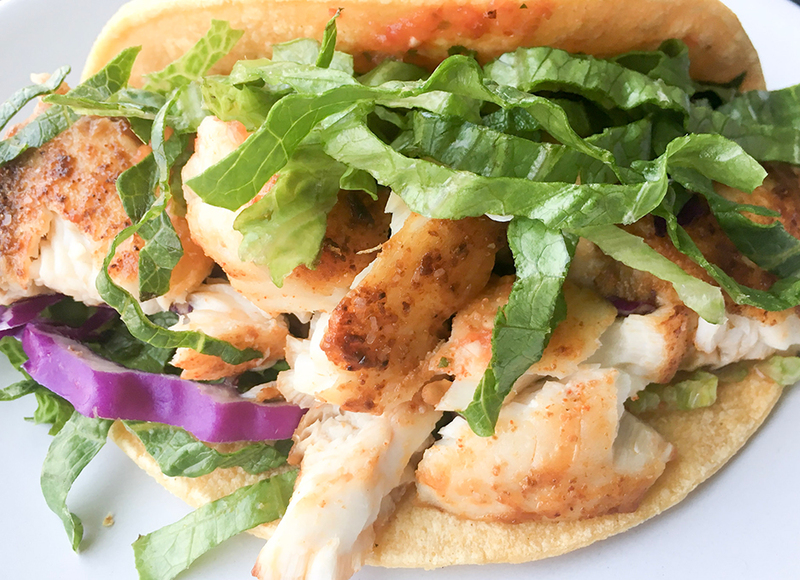 Friday night dinner could not get any easier with this Healthy Fish Taco Recipe. It's light and flavorful. Pull this dinner off in under 30 minutes and your family will be very happy. Ready-Set-Go! For Salsa: In a food processor or blender, blend ingredients for salsa. Blend until you get your desired consistency. Place in serving bowl. Set aside. Cut/Shred taco topping (lettuce, cabbage, etc). Set aside. In a frying pan over medium high heat add olive oil. When oil is hot, add fish fillets searing both sides for about 4 minutes or so on each side. NOTE: Pan fry in batches. Do not overcook. When fillets are done, tent with foil to keep fish warm and moist. Place corn tortillas over stove-top burner and warm each tortillas for 1 minutes or so. Do not allow tortillas to get hard by overheating. TACOS: Assemble tacos by layering with all the fix-ins. Don't be shy when assembling. ENJOY! Corn tortilla can harden when left out for several minutes. Only warm what you're going to eat at that time.